Originally introduced from Brazil as a roadside and pasture grass during the early twentieth century, bahiagrass' self-seeding, low-maintenance characteristics thrived in the scorching heat and sandy soils of Florida. Scientists took notice of this and developed improved cultivars for homeowners. 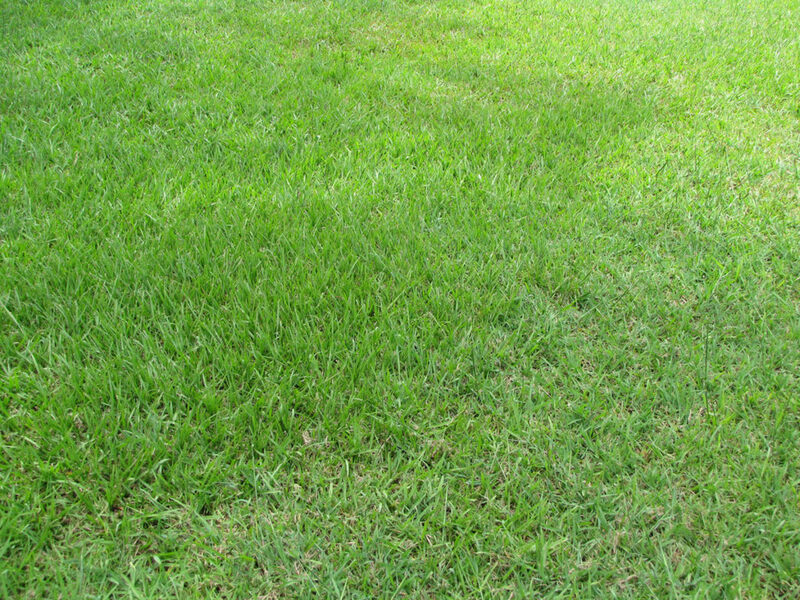 Many homeowners throughout the southern United States now use one of the modern bahiagrass (Paspalum notatum) cultivars as a lawn grass. 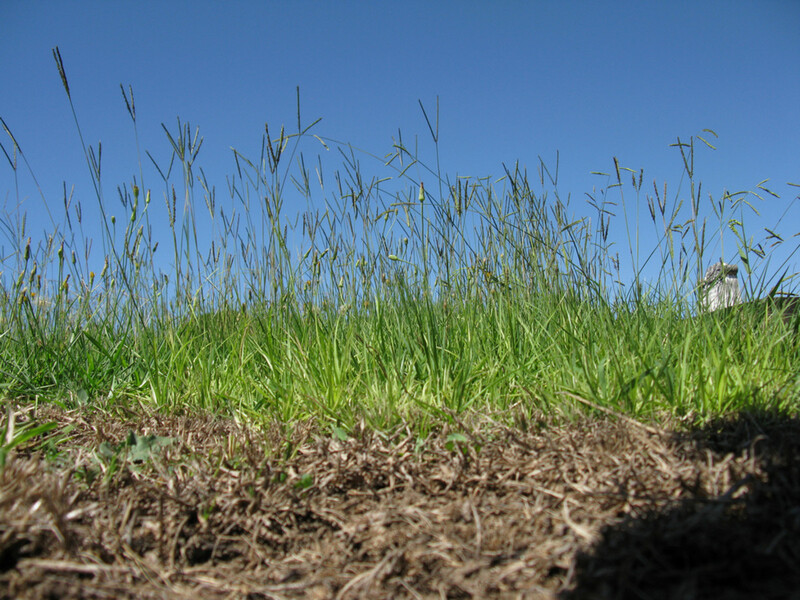 Few insects harm bahiagrass, limiting insecticide treatments. Homeowners without an irrigation system, or those who live in an area with water restrictions, often pick bahiagrass over other warm-season turf types because of its ability to quickly recover from drought. Common Bahiagrass: The original Brazilian cultivar grows unevenly spaced clumps of coarse-textured light-colored blades. A close cut exposes bare spots of soil between the grass patches. It holds up well under moderate grazing pressure. Older pastures may contain common bahiagrass, however, over time modern cultivars largely replaced it. Argentine Bahiagrass: This cultivar forms a dense turf and with dark green blades, making it an attractive lawn covering. An established lawn usually crowds out most weeds. It grows deep roots, which enhances drought tolerance. Few diseases or insects effect the Argentine variety. 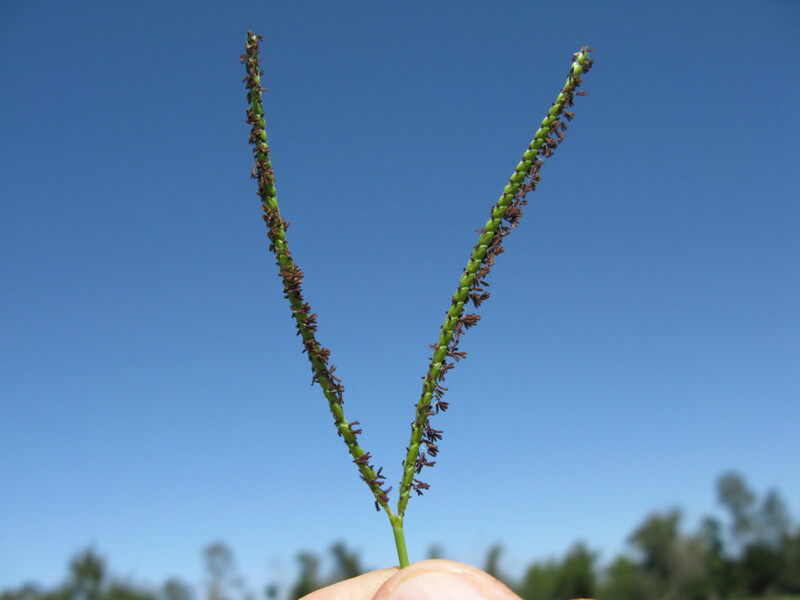 Pensacola Bahiagrass: The Pensacola cultivar forms a turf with longer and narrower leaf blades than Argentine. It also tolerates cold temperatures better than Argentine. However, it produces noticeably more seed heads than the Argentine variety. This reduces its desirability as a lawn turf, but makes it more desirable as a pasture grass. Tifton-9 Bahiagrass: A fine-blade bahiagrass cultivar with a high cold tolerance. It grows fast and establishes seeds quickly. Commonly used in more northern climates as erosion control along roadways and in pastures due to its high forage percentage. Due to its popularity, many home improvement stores and nurseries in the bahiagrass-growing region of the country carry either sod or seed. The advantages of planting sod include rapid establishment and fewer weeds. Starting a lawn from seed generally costs less than sod and it uses far less labor, however, seed takes longer to become established. Kill any old grass and weeds with a herbicide about two weeks before planting, using the manufacturer's directions as a guideline. Rake or till the yard, removing debris and softening the top layer of dirt. 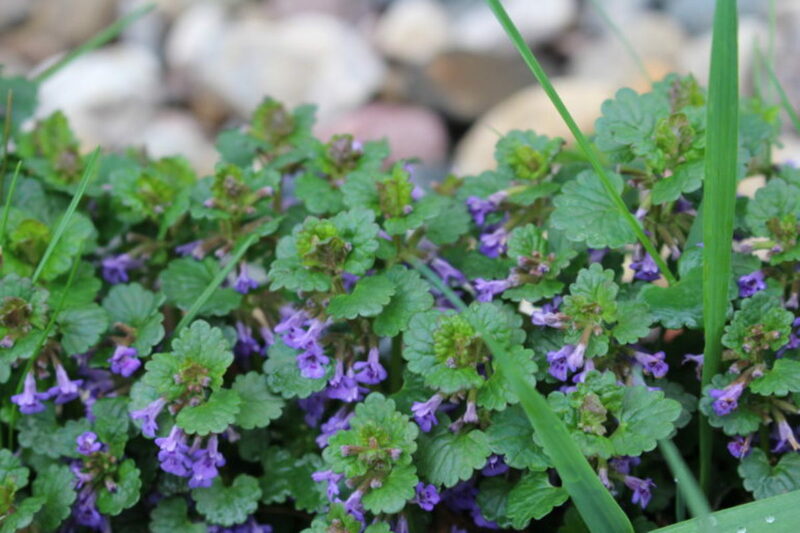 Consider topping the native soil with a 1/4-inch thick layer of garden or lawn soil. These soils contain more nutrients and less weeds than top soil. Level the surface with a garden rake. Lay bahiagrass sod in a brick pattern. 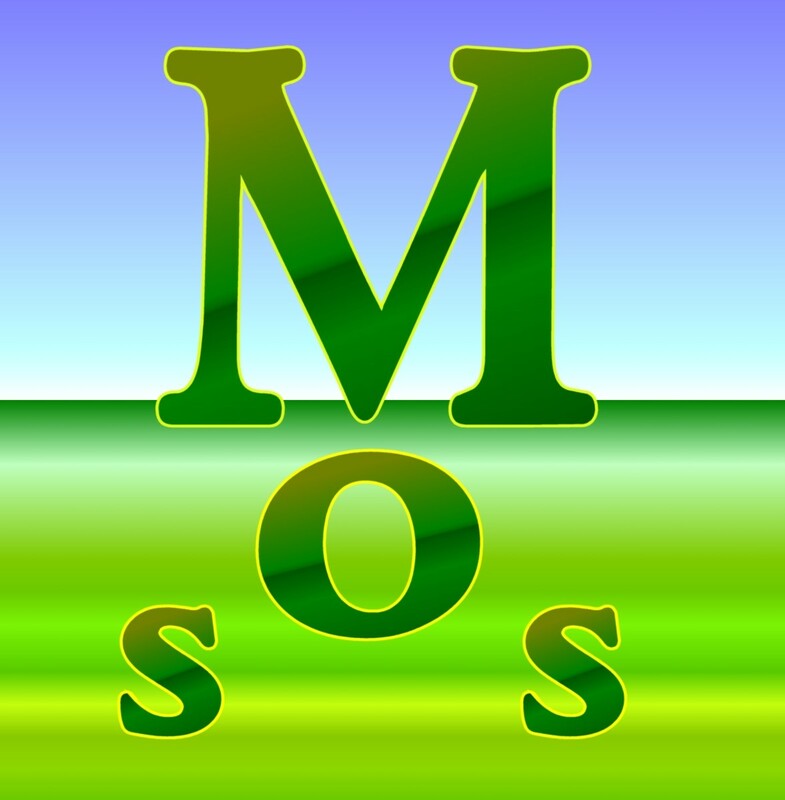 Give the sod multiple 15-minute watering sessions throughout the day for seven to ten days. During the following week, gradually cut back the frequency to twice a day. About two weeks after laying the sod, gently lift up on one corner of a piece of sod. If the roots firmly grip the soil, reduce the frequency to once every other day for a week then water as needed going forward. If the roots failed to grip, maintain the twice a day watering schedule for a week and test again. Do not mow bahiagrass sod until the roots grip the soil, generally two to three weeks after laying. Likewise, avoid applying fertilizer until the roots establish and use a light application of a balanced fertilizer, such as 10-10-10, for the initial treatment. Check the bahiagrass seed container for the "new lawn" or "reseed" spreader setting and adjust the unit as necessary. Apply the seed evenly throughout the application area with the spreader. Lightly rake the yard with a leaf rake, ensuring adequate seed-to-soil contact. Turn on the irrigation system until the top 1/2-inch of soil becomes moist, then turn it off. Do not wash away the seed or over saturate the soil. Several 10- to 15-minute bursts throughout the day produce better results than a few heavy soakings. Continue to water in this manner this until the seed germinates; bahiagrass takes up to two weeks to germinate. As the grass grows cut back on the amount of times watering per day, but lengthen each session time to approximately 20 minutes. Keep the soil moist until the grass blades reach about two inches in height. Start the mowing and fertilizing schedule once the blades become 3-inches tall. 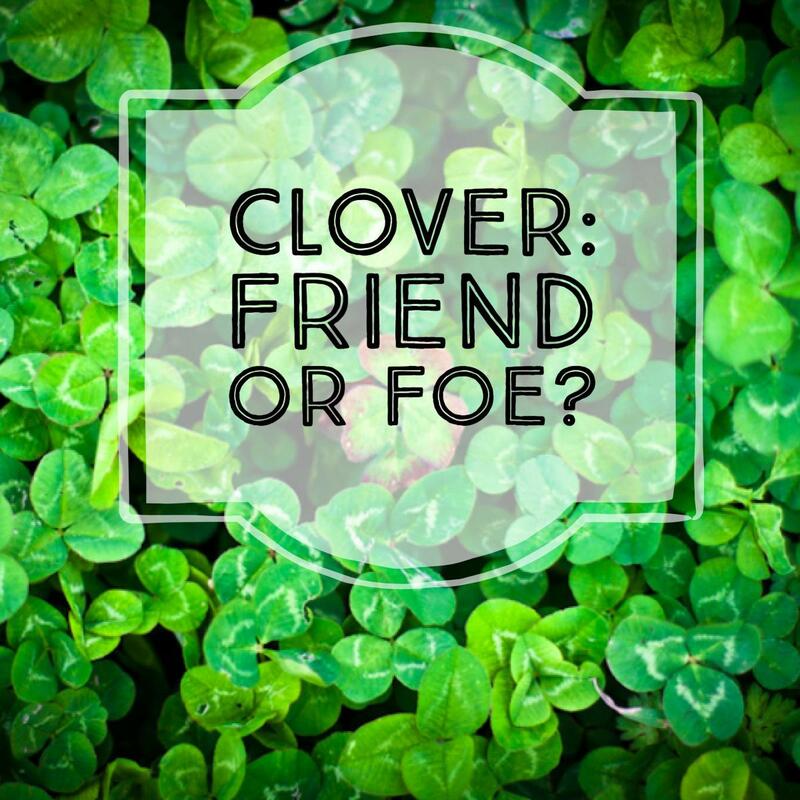 The type of weed and time of the year determines which kind of herbicide to choose. A pre-emergent herbicide inhibits seed germination, but does not effect established plants. Apply a post-emergence herbicide to weeds already growing. Treat the lawn with a pre-emergent herbicide during the cooler months. If the lawn suffered from crabgrass in prior years, give it a second treatment six weeks after the first. Use post-emergence herbicides throughout the growing season, using the manufacturer's instructions as an application guide. Do not broadcast herbicide across the lawn when temperatures rise above 90 degrees. Spot treat isolated weed patches either with a liquid herbicide or hand pull them. When hand pulling, grip the weed near its base and pull the root along with the top. Many homeowners give the lawn an annual weed-and-feed fertilizer during the spring, then spot treat the lawn when weeds pop up through the growing season. However, the herbicide in some weed-and-feed fertilizer products damage Bahiagrass. Do not broadcast any type of herbicide unless the manufacturer's label clearly states Bahiagrass compatible. Before spending money on fertilizer, perform a soil-nutrient test to determine the soil's pH and available nutrients. This inexpensive test takes just a few minutes to complete. Use the results to determine the appropriate product and treatment rate. All fertilizer containers state the macronutrients in N-P-K format. 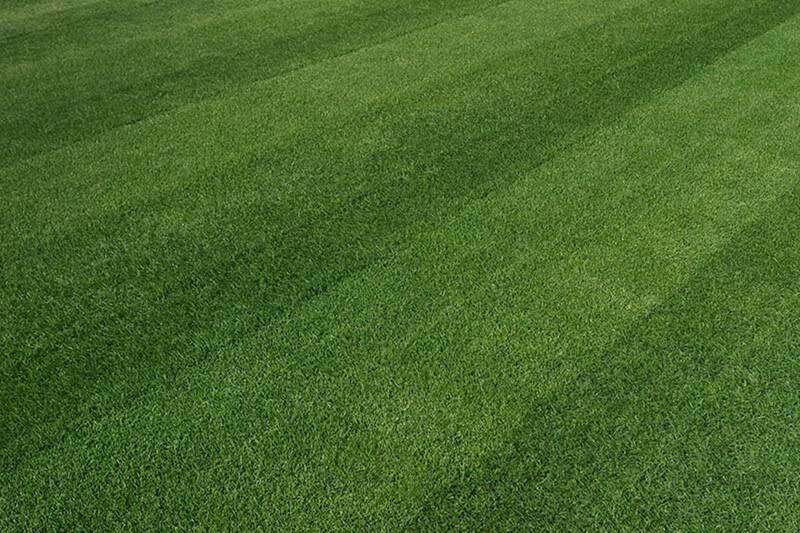 A typical lawn fertilizer contains a large amount of nitrogen, the first number, along with trace amounts of phosphorus and potassium, the second and third respectively. Broadcast granular fertilizer with either a hand- or walk behind- spreader. Apply dolomite lime with a spreader to raise the pH and mix organic matter, such as manure or peat moss, into the soil to lower the pH. 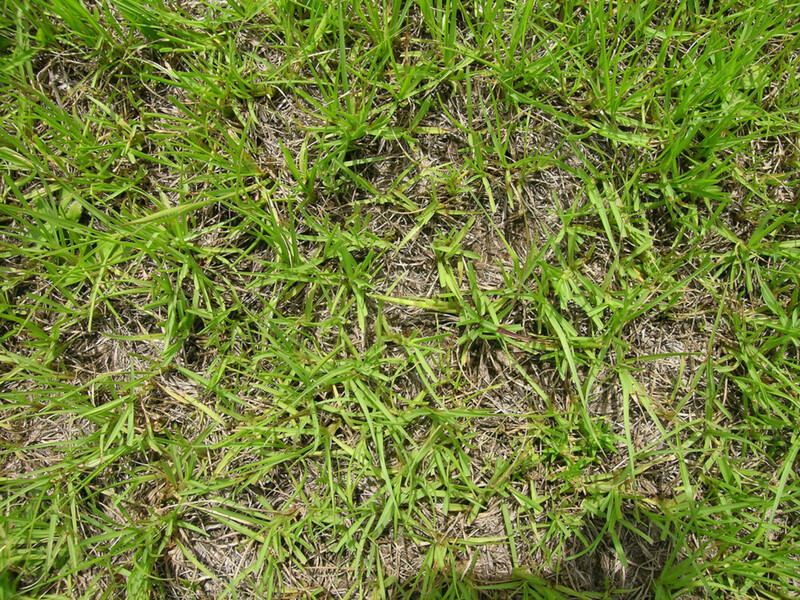 A bahiagrass lawn normally needs a weed-and-feed fertilizer treatment during the early spring, a basic all-purpose lawn fertilizer at the beginning of summer and a slow-release fertilizer, such as Milogranite, six weeks later. Homes in the deep south often treat a bahiagrass lawn with a winterizing fertilizer once the temperatures drop in the autumn. Recycled grass clippings release some nutrients back to the soil, which reduces future fertilizer requirements. Some soil requires an iron supplement application once or twice a year. Iron deficiencies in the soil causes bahiagrass blades to turn yellow, similar to the look of a lawn with a nitrogen deficiency. While both iron and nitrogen supplements give the grass a greener color, nitrogen also makes the blades grow taller. If a soil-nutrient test gives a satisfactory nitrogen level, suspect an iron deficiency. Treating the lawn with an iron supplement will not stop yellowing due to a nitrogen deficiency and excess nitrogen becomes a groundwater pollutant. Set the lawnmower's blade height to between three and four inches off the ground. Mow a Bahiagrass lawn every seven to 14 days during the growing season, depending on rainfall and temperature. Let the clippings settle down into the turf, creating organic fertilizer with each cut. Tall seed-head stems quickly make a Bahiagrass lawn look unkempt. During the winter reduce the mow rate to monthly. Mulching the grass clippings reduces the turf's fertilizer requirements. The clippings release nutrients as they decompose. Routine mower blade maintenance ensures a good clean cut. 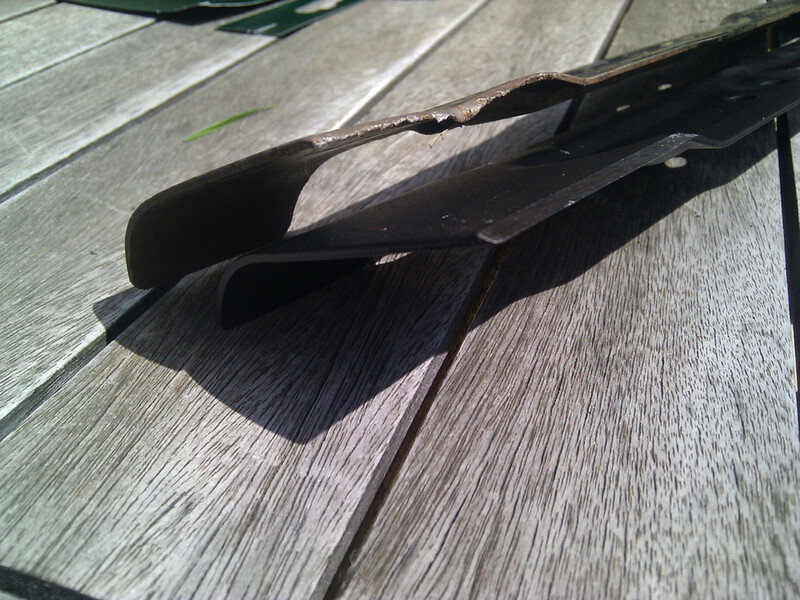 Dull and damaged lawnmower blades tear the grass tips, which not only looks bad but also promotes disease. 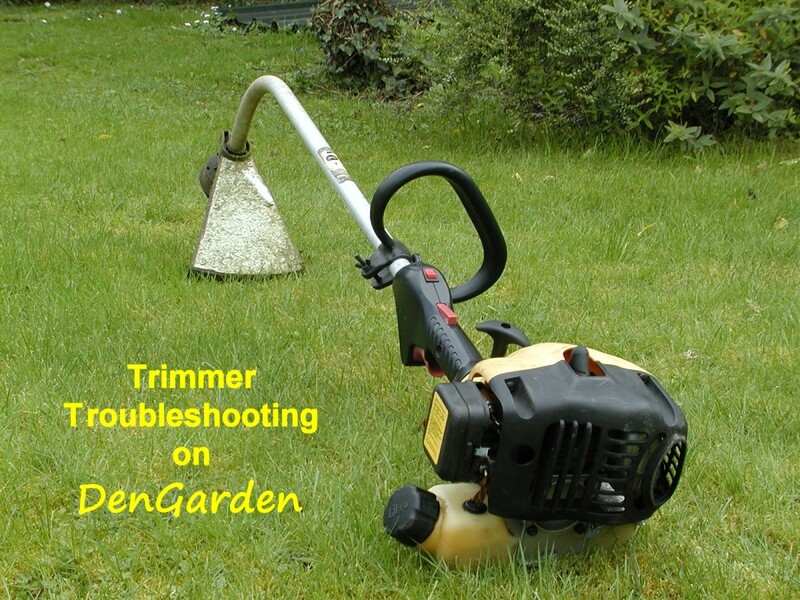 Baiagrass seed-head stems are tough and dull mower blades quickly. Inspect the lawnmower's blades every few cuts and sharpen as needed. In the southeastern United States, bahiagrass normally receives enough rainwater to thrive. However, during extended periods of drought the turf stops growing and the leaf blades turn pale. It quickly revives with even a small amount of water. Bahiagrass' ability to recover from drought makes it the perfect choice for homeowner and farmers with large lots without an irrigation system. Homeowners who want a rich vibrant lawn use supplemental irrigation when the leaf blades begin to wilt and footprints remain visible after walking across the grass. Turn the sprinkler system on in the morning and run for about 20 minutes per section. Avoid watering during the late afternoon and evening. A regularly scheduled application of a broad-spectrum insecticide prevents most pest damage in bahiagrass. These insecticides kill a wide variety of pests, including the mole cricket. Mole crickets burrow through the top layer of soil and damage roots. Treat fire ant mounds with a product manufactured specifically for this purpose, such as Ortho Fire Ant Killer. Sprinkle this type of insecticide over the top of the fire-ant mound and about one foot around its perimeter. This kills the mound and contaminates any ants coming and going. Armadillos and other pests, such as moles, damage all turf grasses while searching for food. Apply an animal repellent at the first sign of damage, then treat the yard with an insecticide. This two-part treatment drives the pests off quickly and kills their food source, which makes them grocery shop somewhere else. What kind of weed and feed actually works for Bahiagrass? Vigoro makes a weed and feed for bahiagrass. It's in a yellow bag. How do you get rid of crab grass in Bahaia lawns? I have had good results using Scott's Halts Crabgrass preventer. Follow the instructions to determine when to apply it. It is a per-emergent herbicide.